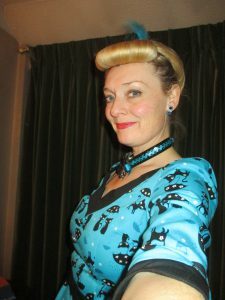 The Old Ye Roe Buck & A New Frock For Halloween! On Stage at The Oliver Hare! Firstly I’d like to start my blog tonight by thanking everyone who came along to hear me sing at The Oliver Hare on Thursday for Leighton Buzzard’s Heritage week. It was a lovely afternoon and those high teas looked wonderful! So thank-you every-one for supporting the event as this week has been all about the “Changing Face of Our Pubs” staged by the Leighton Buzzard town council. There have been all sorts of historical events taking place in Leighton Buzzard’s pubs this week. 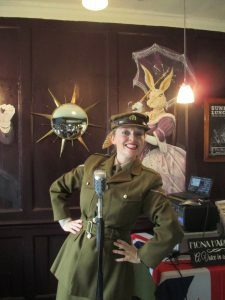 I was engaged to perform an hours show on Thursday songs from the 1940s due to the fact I was booked that morning to perform a “We’ll Meet Again” show and as I had very little turn around time it was nessasry for me to go straight on in costume. Me Trying on My Halloween Frock back in August! 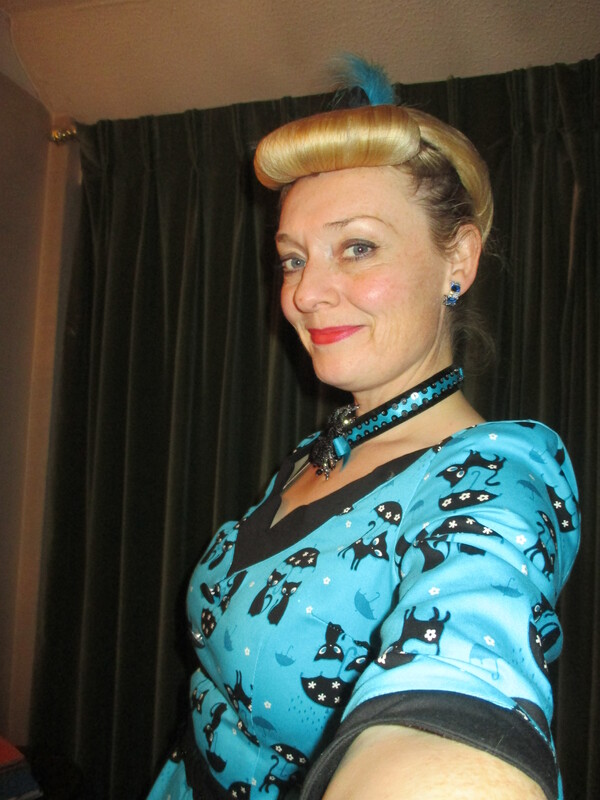 The Black Cat Dress Selfie! the season to be obtained at the above address. I’m not quite sure where the black bridge was in Leighton Buzzard but I can honestly say I wouldn’t fancy bathing in the Ousel today! This weekend I’m out and about performing my “Fly me to the Moon” show for Halloween. I performed the first of this block on Friday and I have three shows back to back on Halloween its self so it’s going to be a busy day. It can be a little difficult finding just the right thing to wear for Halloween. 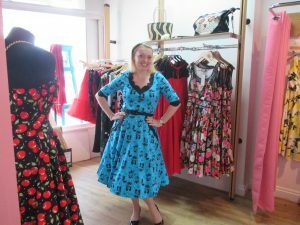 However back in August I found the perfect lucky black cat gown at Flamingo Frocks in Brackley thanks to a tip off from my friend Kim. Next week I start on the run up to remembrance Sunday with “We’ll Meet Again” shows and I’m also booked in with David to see the first rough cuts from last months filming which is all very exciting. More on that next week.